Hostel Orange i Prag, Tjeckien : Boka nu! If you're looking for a quiet, comfortable, cheap and just cool hostel right in the centre of Prague, Hostel Orange is the right place! It's the only hostel located right on Wenceslas Square in a beautiful historical house, so you won't need to use any public transportation or spend your money on it. Staying in Hostel Orange, you'll be in the centre of the commercial, cultural and historical area. There are loads of interesting places to be found around the area. Our hostel was completely renovated and refreshed in May 2011! We offer pleasant, comfortable and cheap accommodation in terms of nearby places to stay. Just look at our prices and compare with others! We accept both individual and group booking (up to 50 people). The house has large apartment, small private rooms and a wide choice of dormitory as well; prices for dormitory start from 299CZK. This large apartment (70m²) has two rooms, sleeps eight-to-16 people and has a balcony right on Wenceslas Square - it's a great view! There is a bathroom with shower, WC, fully equipped kitchen, cable TV, a PC with free internet, and the opportunity to use a common room where you can find another kitchen, cable TV, computers and lounge area. Dorms and private rooms mostly have private showers with hot water 24 hours a day. We have Wi-Fi all over the whole building and that's free of charge! Here you also can find a big terrace on the top floor which is taken as a smoking area or just a relax-and-lounge area. 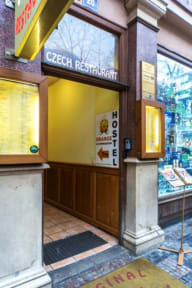 Besides, on the first floor there is a traditional Czech restaurant for where all our guest get 10% discount. We offer free storage of your luggage after departure, free city maps, free clean and fresh bed linen, towels and pillows and free tea and coffee throughout the day. You can also use our iron, hair dryer, a printer, lockers and the valuables safe at our reception. We have local and international calls for good prices, too - just ask! On arrival, we will offer you a map of the city and a variety of information about Prague's attractions and activities. We have arranged discounts for walking or bike tours, food in the nearby Czech restaurant or Thai massage. You can book your tours to the Czech countryside through us, or get a ticket for a boat ride on the Vltava River. Our great location means we're within walking distance to all points of interest, including the shopping area, the Comtessa shop, restaurants, clubs and bars (including Duplex, Celnice, Double Trouble, Chapeau Rouge and Karlovy Lazne - a five-story club). Free walking tour and Pub crawl are organized by our Fun managers Dan or Línda, Naplavka hangout with our Operations manager Tereza. FREE WALKING TOUR STARTS AT 2 PM, PUB CRAWL NORMALLY AT 8 PM, OCCASIONALLY AT 9:30 PM. NÁPLAVKA HANGOUT STARTS AT 5:30 PM. Parking is available nearby for a surcharge. Our friendly staff provide full information suppose and can call you a taxi at any time as well as a shuttle taxi to and from the airport. The location of this hostel is great and the staff very nice. I would definitely consider coming back. The only negative thing is that it is rather noisy. We stayed in a private room next to a dorm with people running in and out late at night and had to use earplugs to be able to sleep. If you are not to picky and easily disturbed I would say that the hostel is well worth the price. Walking tour and pub crawl - great! The rest ok!